News hit social media a number of weeks ago regarding a group of individuals setting up a zip line from Forester's Wall down to the large tree close to the border of Harrison's Rocks. Here you can see one of the individuals setting up the zip wire (face has been obscured). The message to the individuals concerned is clear. "Please do not install zip lines at Harrison's and only use bolts for top rope climbing on sandstone." For many people it may be obvious that the use of zip lines and slacklines connected to bolts is strictly forbidden, but for those who do not know how the bolts work here is why: They do not have the load strength of a traditional bolts, for example like the bolts in limestone. They are only designed for body weight loads and nothing more and are only safe when used with the force pulling in a certain direction. Excessive force from items such as zip lines and slacklines will blow the bolt completely. An example of this was seen above the line of Wooly Bear on the Isolated Boulder where a slackline was installed and the tension placed on the system caused the rock to explode and the bolts to rip. Unfortunately the individuals were disappointed when challenged and did not take kindly to being asked to remove the line. The line was eventually removed but not after the line was apparently used by a few group members of which there were twelve or so in their early to late twenties. The picture shown is one of the individuals who did not mind having his picture taken, but for the purpose of this article we have blurred out his face. 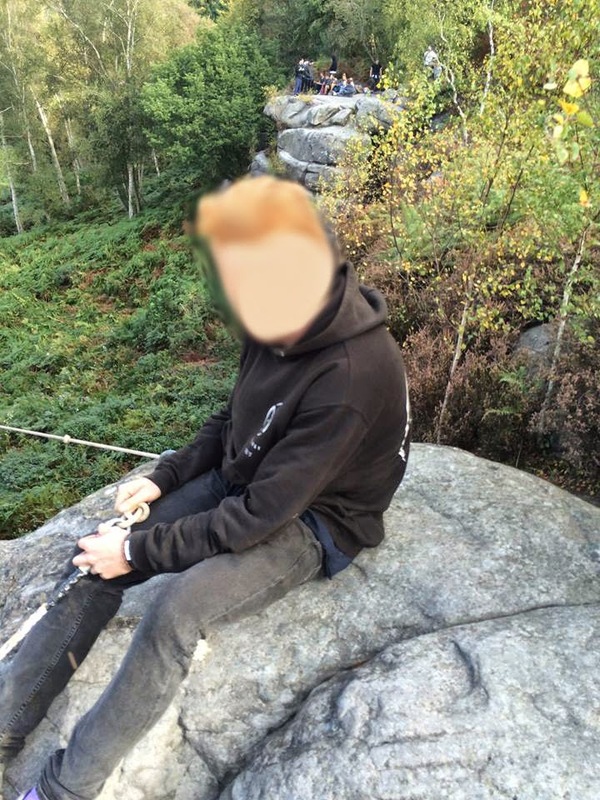 The incident was reported through the Southern Sandstone Climbs (SSC) Facebook page and the HRMG were informed. The HRMG wish to thank the individuals who contacted SSC and additionally spoke to the zip-liners. The HRMG fully support your intervention regarding this situation. Many thanks!